Almaden Quicksilver Park is a large county park. It doesn't have too many bike-legal trails, and all that are bike-legal are fire roads. This ride does the biggest bike loop that is possible in this park, along with a couple of minor side trips. The park covers territory where intensive mining for cinnabar has taken place from the 19th century until the 1970s. Cinnabar being the ore of mercury ("quicksilver"), the area has high levels of this toxic metal. For this reason, for example, the fish caught in the Guadalupe Reservoir in the park is considered contaminated and inedible. To this day, this park is named as the single biggest contributor to the mercury contamination in the San Francisco Bay. The high levels of mining activity in the park also mean that there are plenty of historic remains here. These include some abandoned towns and town sites as well as many mine entrances, at least one tunnel, a couple of cemeteries, and a few mining facilities and equipment. The highest number of things to be seen are in and around English Camp on Mine Hill. The route shown on this page visits several of these in the first half of the ride. The second half of the ride encounters very few mining artifacts. The ride begins from the Hacienda (southeastern) entrance of the park. The parking lot at this entrance is a free one and is generously sized, though you shouldn't take that to mean that you're guaranteed to find a space. I've seen it fill up easily on popular days. As always, you'll have a better chance if you arrive early in the morning. As soon as you start pedaling, you'll be doing a long and uninterrupted climb, which makes up the majority of the elevation gain of the entire ride. This climb on Mine Hill Trail lasts for just under 2 miles at a nearly constant grade around 8.5%. It ends at the junction with Castillero Trail, which you'll need to turn onto if you'd like to visit English Camp as shown on this route. In addition to being a small mining town dating from the 1860s, this location apparently also housed a Civilian Conservation Corps camp under the name of "Camp Mt. Madonna" during the Great Depression. Today, I can find only two buildings standing in the core of English Camp, but there are some other artifacts to be seen here as well as several information panels, some featuring period photos of the location. There's also a high density of trails and paths in this area, evidencing the fact that this spot was a settlement in the past. Almost as soon as you return from English Camp to Mine Hill Trail, the ride follows a side loop on April Trail. This loop is mainly aimed at seeing a few more historic sites, including one well preserved powder house and a few mining structures related to April Tunnel. This mile-long side loop does add nearly 200 more feet to your tally of elevation gain and it doesn't provide much more than a close look at those mining remains. So, those interested in keeping the ride as physically undemanding as possible may leave out this diversion without any regret. Your elevation gain resumes when you get going on Mine Hill Trail once again, but the grade of this portion of the climb is less even and usually more moderate. On this stretch, you'll see that the ride pays a visit to the spot marked as the San Cristobal Mine, which offers nothing more than a fenced-off mine shaft entrance dating from 1866. 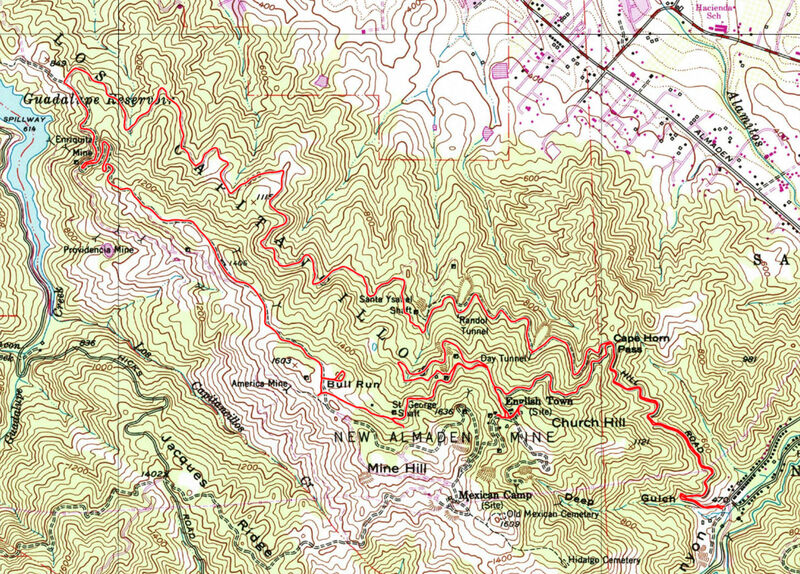 The ride's main episode of elevation gain ends at the second junction of Mine Hill Trail and Castillero Trail. You'll be able to catch views of Mt. Umunhum from this junction, which will be an almost constant accompaniment to the following one or two miles of your ride. Very close to this junction, you'll also see that this route takes a short side trip to "Catherine Tunnel". I don't know the detailed story behind this spot but, today, this feature looks like nothing more than a large ditch. If there ever was a tunnel here, either its entrance must be buried somewhere along that ditch or the ditch itself may have been formed by some kind of a collapse of the original tunnel. When you get back onto Mine Hill Trail one more time, a different riding experience awaits you. From this point forward, the trail begins a gentle descent. After going through a small patch of trees, it also begins to follow a grassy, scenic ridgetop open to occasional views on both sides, with the left side still looking at Mt. Umunhum and the right taking in views of the South Bay. The descent quickens as you get closer to Guadalupe Reservoir and nice views of the reservoir lake open up as a short series of descending (extremely wide) switchbacks begin. Shortly thereafter, you'll have to make sure you don't miss the right turn onto Randol Trail. This marks the beginning of the return portion of your loop. Randol Trail weaves in and out of the creases of the hillside and gently undulates over minor humps once in a while. On average, it very gently gains elevation, but you might not even notice this. Overall, Randol is a pleasant, hillside fire-road ride under partial oak tree cover. In one stretch, the trees open up to allow more views of the neighborhoods near New Almaden from several spots. Along the way, you'll also pass by a couple of remains of the Santa Isabel Shaft and find an information panel telling its story. Once you reach the first multiway intersection you had been through near the beginning of the ride, you'll know that all that's left is the short but steep and fun descent back to the parking lot. If you like the idea of a taking bike ride to gaze at occasional historic remains but need more mileage to satisfy you, there are a couple of things you can add to this ride. One obvious idea is to include more side trips within the park on some of the few bike-legal trail segments in the park that are not already included in this route. Traversing Castillero Trail as a side loop would be one such option, and that would also allow you to visit what's possibly the single largest mining structure to be found in the park today, which is marked as "Rotary Furnace" on the park map and can be found near the junction of Woods Road Trail and Yellow Kid Trail, just off Castillero Trail. If the thought of perusing a few 19th-century headstones sounds interesting enough to you, an out-and-back side trip to Hidalgo Cemetery could also be worth your while and would net you another mile of additional pedaling. Beyond these, the only other option I'm aware of is to head out of the park on Woods Road Trail to connect to the Sierra Azul Open Space across from Hicks Road and explore the additional fire roads in that park, possibly leading all the way up to the peak of Mt. Umunhum as long as you have the legs and the lungs that it would take.